Today is the day some people celebrate the legacy of St. Patrick by wearing green, wearing shamrock antennae, and — if you’re a drunken, mannerless troglodyte — randomly walk around pinching people who didn’t wear green. The whole pinching thing is an unfortunate “tradition” that many critics say is just another form of drunken harassment against women. It’s the kind of behavior that probably shouldn’t be encouraged by a multibillion-dollar beverage company with a lot to lose if it’s sued for suggesting that people get drunk and pinch people on the street. 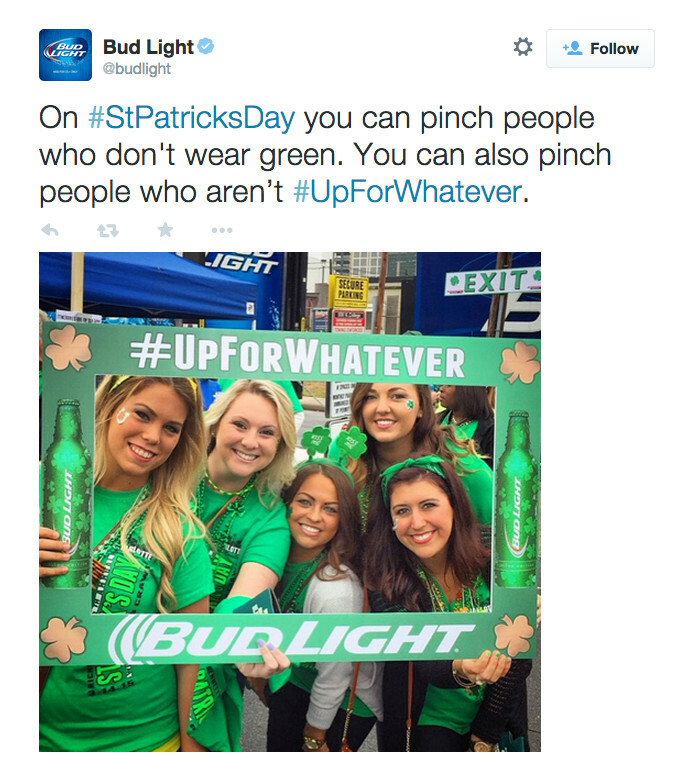 Amazingly, it took two hours for Bud Light to realize that maybe it wasn’t a good idea to tell 127,000 Twitter followers that it’s alright to pinch people because it’s March 17. In response to the backlash, Bud Light issued a statement saying it never meant to encourage that drunk a-holes assault women in public.